There are many types of adventure in this life. Adventures with your career, your family and friends, a solo ride down to Ushuaia, the Southern most city in the world, but there are also adventures of a moto-spiritual kind, ones where you can a enjoy exhilarating and thoroughly satisfying material pleasures one gets from riding, while also experiencing powerful bonding with God, expressing gratitude for his creation, and sharing those moments of pleasure with others. We are attempting to humbly build that kind of group here in the Kent area. We are not exclusive, but inclusive of any type of rider and any faith background with the only intent that we want to share a little bit of our time here in the moments we have in this life, to not only have great fun and memories together, but to also be contemplative and seeking to discover what the rest of eternity might hold for us. We are part of what is called CMA/Fast Lane which is a new ministry of the Christian Motorcyclists Association and we’re the first chapter of its kind in Western Washington. 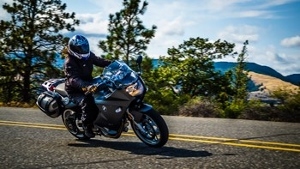 Fast Lane has a specific focus to those who ride Sport and Sport Touring bikes, Adventure and dual sport, single track, as well as ATVs and quads. But really, it doesn't matter what you ride, or where you ride it, as we welcome all with open arms. We seek to create a balance between having great rides with reaching out to those in our community with service opportunities, most of which, but not all, directed toward motorcycling groups or clubs. We have been working diligently for many years, for example, with the road racing club here in Washington, and we were even awarded “Corner worker of the year” for our service at the races in 2013. We also attend and assist where needed with rallies such as Sound RIDER!’s own Rally in the Gorge, the Desert 100 off road event, Rainier Flat Track races, the Oyster Run, various charity events and local bike nights. But it’s not all work. At least monthly we get together, usually after our monthly breakfast meeting, where we’ll take a nice long 250-300 mile ride in the mountains or spend a day riding in the dirt somewhere. We have plans for things like hosting our own beginner level track day, overnight adventure rides, family picnics and potlucks, and even our own regional Fast Lane rally in Kamiah, Idaho, each year which is a free event to non-CMA members. Here’s a partial list of things we are involved in this year. May 31. Green Dot off road/dual sport ride (mid-size and small dual sport and dirt bikes only for this one). June 14-15. Black Dog Dual Sport. A few of us are heading down for three days of camping and riding. All size bikes are welcome. June 21. Breakfast at Maggie’s in Kent, then over to Kitsap Peninsula for road and off-road riding (we’ll have routes for both), and then a bbq lunch at Dana and Donna’s who live right next to the trails at Tahuya. June 28/29 WMRRA @ The Ridge Motorsports Park and CMA Day / feed the racers. CMA is being honored with a day at the races to get riders a taste of racing and then that evening, we will be hosting a free bbq (paid for by CMA and Racers for Christ) for the racers and families. July 4-6. CMA State Rally at Easton. This is a great time of camping, riding and hanging out less than ninety minutes from Seattle. No need to be a CMA member. We’ll have rides planned for street, and dual sport/adventure. Lots of fun stuff planned for kids, bbq, ice cream runs, bon fires, etc. July 26. 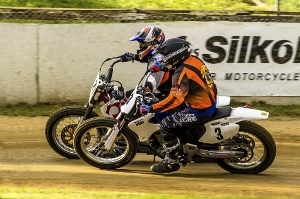 Flat Track racing at Rainier. We’ll meet for breakfast, then take nice back roads down to Rainier and enjoy a day of racing out in a great location. Last race, there were 400 entrants from age five to 65. $10 gets you in the pits where you can sit on a soft grassy hillside overlooking the track, mere feet away. August 1-3. Overnight self-supported adventure ride in the Central Cascades. Three days and two nights camping under the stars. Newbies welcome, no fee. August 28th - Sep 1 | Rally in the Gorge. Can’t wait to check out the new location. September 11-14, 2014 - Roads & Trails Rally Series, Fast Lane, Kamiah, Idaho. Great location near the famous Highway 12, Lolo Pass route. We start our mornings with a quick devotional to get our minds and hearts right, and then ride all day, on some of the best paved, dirt, ATV trails in the Northwest. Then a little worship time and relaxing each night, then repeat a couple more times. Free event other than your costs for food and lodging. This is only a portion of the types of events and activities our chapter is involved in. We’re small, but we’re passionate about riding, our service to others, and about our desire to motivate one another in our walk here on earth. For more information, contact rob at rnewman34@comcast.net, or visit our Facebook page at www.facebook.com/groups/motomessengers. Editors note: ALL clubs and organizations in the Pacific Northwest are invited and encouraged to provide Sound RIDER! with a 500-1,000 word article and 2-4 photographs for publication. See our writer’s guidelines at: http://www.soundrider.com/aboutus.aspx#Write_for_Sound_RIDER!